If you are only selling a few products, you will not need the professional seller account. This is required if you are looking to generate some steady revenue source through Amazon. Also, keep a note that Amazon has multiple marketplaces and each of them have their own set of rules. Take for example: With the professional selling account of Amazon Mexico will allow you to sell on Amazon USA and Amazon Canada, but to sell through Amazon India or Amazon Australia, you’ll need different accounts of the specific marketplaces. Since you’ve already done the painstaking work to list your products on Shopify, your Amazon and Shopify integration should not be so difficult. But this is only possible if you select the right tool for your integration. Also, you need to choose wisely for the underlying options for product customization. Recently, Amazon has made it compulsory to enter your developer account for bulk product listing. Your Amazon to Shopify product listing tools should be able to sync products both ways, or at least allow you to create product feed and submit it to the Amazon marketplace. While selling your Shopify products on Amazon, it is necessary for you to check the competitor pricing. You could do this manually if you are selling a few product or selling products under the same niche or the same Amazon category. However, if you are selling products under different categories, you will need a reliable product research tool. A common trick is to search for the products that you are trying to sell as a buyer and check the product details for optimization and competition ideas. You can also find different browser extensions for this purpose. Or, if you are really serious about selling through Amazon, you can also subscribe to some premium tools like jumpseller. Obviously, the right practice to follow is to treat the customers from Amazon with utmost importance. When they buy your products, make sure to ship them on time and with accuracy. The product listing tools can also help you to notify about your sales by triggering emails or display the sales on dashboard. However, you need to select the shipping tools yourself unless you’re subscribed to the FBA (Fulfillment by Amazon). Also, when you select your shipping tools, make sure that they have appropriate offers and channels to meet the requirements of your specific Amazon marketplace. You can check this article for the shipping tools selection. 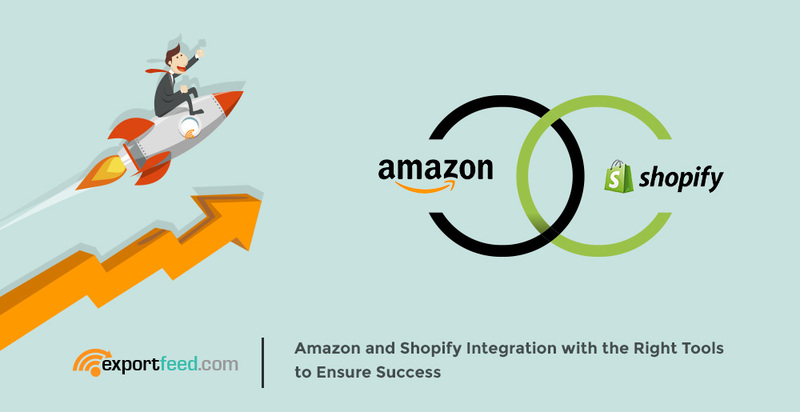 Why choose ExportFeed for Amazon and Shopify Integration? Our support team will help you through each step when you need.